This site is the home of the mcHF QRP transceiver. It is a small, home-brewed amateur radio project. Firmware is released as open source and most project files are released as well, with the only restriction of not commercial use (manufacturing and sales of kits or complete product). Looking at the block diagram (Fig1) it should be clear that my design goal was to make it as cheap as possible – without sacrificing functionality – and include the ability to add new features via simple software update. The choice of architecture is a direct conversion receiver and transmitter, with a small micro-controller to provide control and DSP functions. The analog blocks in this implementation were kept to the bare minimum. Shifting, as much as possible, functionality into the digital domain. Some datasheets with more detailed description of the design concepts of individual blocks are available at the Downloads page. It took some two years to the moment i can offer the mcHF in kit form. It consists of two boards with populated SMD parts and extra components supplied in plastic bags. The kit does not include speaker, final MOSFETs and enclosure. It is worth pointing out that the kit requires some advanced soldering skills and knowledge in electronics as mods might be required. Also extensive tuning and calibration might be needed, or sometimes debugging of problems. It is not recommended as first kit or if you expect to be on the air after few M3 bolts tightening. I have a problem with ACC not switched on when I press the HASH knob and the DIT button is ON. Also, do not turn PTT on the microphone. What is the problem and how to fix it. I am very delighted with this transceiver and enjoy working with him, thank you for a nice and useful project and especially for building it myself. Please answer me ? I’m very happy with the equipment and thank you for the extraordinary project. My name is Jozef and my call sign is OM5DL (ex OM5AIM). The McHF project is a very interesting and excellent to me. Congratulations on this original idea, and I wish You and Your co-workers many creative suggestions, wise and practical solutions and many satisfied radio amateurs – customers, and I want to be one of them. I was given the opportunity to get a gift for the upcoming Christmas, which would please me. So it’s time to fulfill my dream of a small, practical HF, SDR, QRP transceiver. While searching, I was positively influenced by Ludo OM6IN (ex OM6ADP), who built McHF 2x the v 0.4 and 4x the v 0.6. At home, I work with the Kenwood TS 480 SAT and the DeltaLoop antenna. McHF will be the perfect radio for me for portable, YOTA activities and DIGI modes. I know that you are working intensively with your co-workers on the v 0.8 and that the v 0.7 are still on sale. 1. When do You really plan to start selling the v 0.8, if you already know it, at least with some probability? 2. How will the v 0.8 differ from the v 0.7? 3. What is the estimated price of the v 0.8 – full kit? 4. Are You able to sell me the v 0.7 full kit with SMD boards?Because I do not have any chance to put them in. 5. Can I buy the box and the speaker for the v 0.7? 6. How much would mcHF be the v 0.7 full kit with SMD boards + speaker + box? 5. Please check the Order page, lots more info about that. I would like to get this But will it be able to Tx on the 11Meter Band? In theory yes, not sure if it is enabled in latest firmware though, best to check their Wiki. Getting ready to upload the boot-loader into my new v.7. I have all the boards together and a safe way to maintain power ON during the P6 closed method. If I am using the “P6 closed” method and sequencing the “+Band” switch, do I need to Connect 5V to pin28 of UI board header, and Pin 12 at connector P1c or Pin 6 on connector P1b? Great idea and congratulations on this project. Im nearly sold in buying one. Just to suggest a feature that will help with qrp operators especially the beginners: To add a tuning feature that could incorporate the use of the “Tuning” button. This would allow auto tuners like AT-700 and the like to mak antennas resonant. Overall im impressed and still pondering weather I should buy one. (this is only because of my confidence to build myself). I have seen how the market for low-cost mcHF versions assembled in China is being filled. I guess you vd. There will be hardware modifications so that the new firmware will not work in the Chinese units and make them obsolete. But what would happen if I bought the old version of the mcHF from you? Will it still be supported? Hi, it is open source project. Not really possible. It is one of the drawbacks, you can’t force people to respect your license. But it is deeply unfair. My comment is because version 0.6 seems to be more ergonomic than 0.7. In appearance it can be operated with one hand and can be integrated into a vehicle or a rack. Unable to supply version 0.6, you would be paying the land to the Chinese clones. I agree with you but given the project type it’s really down to people being and encouraging ethics. Buying the clone commercial radios built from the sweat of others imo is shameful. I can’t imagine the 1000’s hours of work invested. The cases and supporting products not so bad and may even be a positive. Supporting the maker is the key. Absolute generosity to release this as a home brew kit. Is it possible, or do you have a mod for the unit to operate on the VHF/UHF CB bands? Hello, i have a question concerning the bandwidth in TX mode, there are two setting 1.8KHz and 2.3KHz with center adjustable, that means there is no possibility to adjust the low and up frequeny, is it right ? do you take donations by paypal? I would like to get a kit with all parts. Order page shows Sold Out. Please put me on wait list and send me email when kit available to buy. It’s been a long time mate but just wondering is your kit doing 160mtrs yet? No, not really. I see somebody added this in the firmware, but the SI570 would not go that low, is there a mod for it i missed ? Hi Chris, I just wanted to stop by and say THANK YOU for a quality kit & great design. I have almost completed the kit now, just a couple more components left to mount. Hi Chris, any idea when the smd mounted kits will be available. I would gladly have paid a few extra pounds for a couple of extra of each of the caps, resistors, inductors, diodes, and transistors. This might be a good option. I do recognize that there are a few extra components in some of the packs. I am finding that on occasion a component snaps out of my tweezers. The actual management of putting extra parts, keeping in mind how many components we have in BOM, is a huge task. So we try to add extra components when we can, but is not intentional or managed. Also those components go out of stock constantly with the supplier, so it is not easy to source for each batch anyway. Hello, a couple of questions. (1) Is there any way to switch an external 160M LPF? I really like the concept of the rig, but as a die-hard 160M user I keep getting stuck on the lack. (2) Does the AM TX work at the “extra wide” filter settings, or if not how does that work? Congrats on release of Ver 6. The dc feed thin track , to the power amp, might still be causing interference. 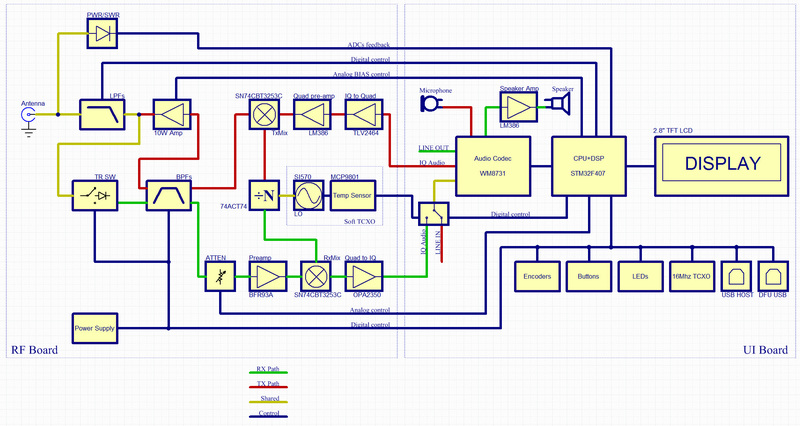 Secondly , the PTT circuit element using mosFET to switch the opto , I fear, is an overkill. during Rx mode , the gate appears floating,without any termination, picking all sorts of induction. I admire removal of LM386 completely. Probably in week or two, still haven’t sorted it out properly. on question , rfboard 0.5 firs to uiboard 0.4? i’m buy second hand mchf , and rf board is in bad condition i think it’s good idea to make new one. Yes, you can plug both boards together, no problem. Before ( in my 4 equips ) I was loading the DfuSE to prepare the CPU and then with the mcHF manager was loading the corresponding update. Now the thing has changed and I am confused and do not see the sequence clear. I am going to mount 5 º equipment and it wanted to be able do exactly like to prepare the CPU and to load Andreas’s new updates. Where it is explained? I just placed one kit order , but I missed and used wrong shipping address , I sent you an email to your Paypal email account to explain that with right UK shipping address , please check and reply my email . all sorted, i believe. 73! Forum topic I created for advertising and promotion of your design of the transceiver. Please help save time in the development of new PCB. Send me please the source device circuit in Altium Designer. I do not design for commercial profit, but only for his own amusement. as I can, need to brush up on my Russian, as it is relevant to the 1980s more or less. Drop me a mail if you want to talk more (djchrismarc@gmail.com). I understand your concerns and position. Nice project! Has anyone investigated the receiver’s sensitivity across the HF spectrum? Also, can it transmit outside the ham bands by applying a mod (I am sure it can!)? Don’t ask questions like this. It is a legitimate question for those with intentions for MARS operations. Is it modifiable for out-of-band operations? The project is Open Source, you can re-compile to TX anywhere, as long is not too much outside of the pass band of the filters. Today, for the purchase on October 19, it was sold out in PAYPAL. Would you like to when released? Hi, sorry. Finished the toroids, will probably get them tomorrow and relist. 73! hi there this seems like a great little kit however i note the full kit is not so full and requires extra parts what exactly is missing and where would be likely places to get them. – casing – it is personal preference what type casing to use, most hams prefer fabricating one themselves. Output power by design is 5W, but there are mods that allow for slightly more. Please check the GitHub for latest firmware, the German Hams already added this. I just ordered the kit. I’m very curious how it will work. Sounds great Chris. I will order tonight and I look forward to becoming part of your technical community. Please give me an idea of shipping cost to Hawaii so I have no surprise when I order. I look forward to building the kit. What bandwidths are available for AM TX? somewhere in the User Guide. I have it on my Downloads page. Thanks for your comments. The rig is ver 4 hardware running 219.26.4 firmware. I initially thought I had a general issue, but your comments made me go back and take another look at the transients. When I looked at the I2C data and clock lines to the audio codec (at R20, R21 & R22) I found the data was actually sent in the quiet period immediately after the “splat” and before the carrier ramps up as it should, so although my suggestion should have worked it would have been for the wrong reason. Also the transient at the start of the sideband transmissions takes a different form in that there are 2 distinct pulses during the first 50mS of transmission giving the blip on the spectrum display. The AM and FM modes come up very cleanly but always drop out for 10ms after the first 100ms of transmission. These measurements can be made using a scope on C7a and/or C8a on the UI board with a trigger taken from the junction of R13 and R14 (PB1 or PTT in the cct diag), as I have found that the output tracks these signals very closely after all the mixing etc. I must admit that I have only the one radio to look at so I have to make sure what I am seeing isn’t because of my soldering. Havng built one of these kits (V4) on behalf of a freind I was examinimg the Tx characteristics when I noticed (initially in CW mode) an 8mS Full Power “Splat” before the transmitter generated a clean signal. This “splat” gives rise to the spike that appears on the spectrum display when keying up in side band mode. I traced the source of the “splat” back to the audio codec IC U1 where it appears to be the data signal setting up the codec for the change from Rx to Tx appearing on the LOUT and ROUT lines (pins 12 and 13 respectively). I would suggest a simple fix is to delay the switching of the PB1 signal until after the data has been sent to the codec chip instead of before it. All the supply and PTT switching resulting from this signal happens very quickly and is stable by the time a stable carrier is generated, you may get the noise burst appearing on the Rx audio, but at least it isn’t being transmitted at full power (this is irrespective of the power level selected as the power control ccts don’t have time to react). Thanks for your input. I think i have seen somebody reported this issue in the group as well, it might have been you. v 0.2 of the boards, and more or less very basic functionality in the code. And i haven’t seen this(or maybe missed it even then?) At this stage, many changes on the boards and firmware extremely bloated. So it is possibly that was introduced later. as well ? If the latter, maybe is good idea to post as issue there, as i currently don’t take part in their development. I am sorry, but the mcHF is a project, not a complete product. If you need something Plug and Play – best to go for the KX3. As for mods, yes, there are many mods offered by the German ham group, they have it explained on their GitHub page. I believe Chris, M0NKA, has really hit the nail on the head with this mcHF project. After 2+ years, there must be quite a qty of these kits out there and the enthusiasm to jump in and make modifications and enhance the code is exceptional and enviable (we started the SDR2GO project a few years ago and handed it off to Dave where it evolved into the STM32-SDR). I would attribute the mcHF success FIRST to Chris’ overall design point and features (and price ….although lower is always better). I even see some hams jumping in to offer very nice CNC machined enclosures. Every contributor has their area of expertise and there are a number of experts out there willing to contribute their time. Fantastic and Thank You. As with all new designs, there will be some changes needed …..RF spurs detected, filters which could be better, Amplifier stability, unwanted noise, new TFT displays, better AGC algorithms,etc. In addition to those, there is an additional “wish list” which is a whole lot easier than writing working firmware, and handling fixes has to take priority over it all. I see an excellent rundown by Andreas, DF8OE, on recommended changes for the Rev 4 boards. Is there a similar list for Rev 5 ?. I see that Clint, KA7OEI, is handling some code changes/fixes/upgrades for Rev 4 …. and Rev 5 ? Is he the control point and is there a list of firmware levels ? similar to what Andreas has ? I think “many cooks” is great but that can result in multiple directions and is confusing to the rest of us who are new to the project. I would like to see continued and structured support for the mcHF for many more hams to build with the kits and boards offered ……and not have it fade into the ether. Maybe I’m just easily confused. With more people wanting to contribute. what is the centralized (hopefully) control structure ? Who does what ? where is that posted ? ….hunting through all the emails does not cut it. …..what design changes are officially recommended, what code is tested and integrated into the latest official release, etc, etc. Yes, kits are in stock. Will this TX on 60 meter? I would buy the complete kit of ‘mcHF with payment via paypal. what is the procedure? You need to register? or just make payment via paypal? when available the mcHF pro? have look at my website when you have a minute. You may be able to salvage some ideas from my failures! I couldn’t find anything about the heatsink dimensions for the final transistors. Please tell me if it can be fitted in the 3D printed case? I am finishing the new 3D case, where everything is different. There are two small alu studs aprox 24x14mm, that transfer heat to two external heatsinks 41x41mm big. Soon will publish all documents. Can you tell me what else is required to complete the full kit ? The RF output transistors and anything else ? Do you know where these can be purchased (UK/EU) ? There is an aluminium case for sale on ebay, 252285831337, for £120. Is it sanctioned by you ? Will it work with v0.5. Hello, transistors, best from reputable source, like Funk Amateur. Speaker from Farnell, or if you have one in the junk box. Those cases are not from me, I don’t mind them for sale, it is accessory. But i have one like this, needs a bit of modding. Sorry,can’t confirm v 0.5 compatibility, 73! but I had wrong address for delivery. Merci de me signaler quand vous aurez des kits disponibles . I ordered your boards and I am very excited to get to it. I just needed to chime in and say, yeah, I am a 160m guy, and I wish it had that band too. Keep up the great work and 73. Well, I am no expert but wouldn’t there be more required since the LO Si570 will only go down to 10Mhz? And the Tayloe uses a divide/4 making the lowest frequency 2.5mhz? You would have to divide again requiring more circuitry beyond filters? I understand. Yes, the kit has all parts, except the final MOSFETS, speaker and enclosure. The cheaper option for you would be to get the just the PCBs and buy the parts yourself, i have Farnell BOM on the Downloads page, also US centric BOMs available in the group from colleagues. Another saving option is to not fully populate both boards – you can do the UI board, then only the RX path and power supply on the RF board (no filters or relays and tx path). Or even cheaper option – get the UI board only, buy parts yourself and populate, then interface to a Softrock board, and use a makeshift power supply.